The goal of the experiment is to show the dependence of the secondary voltage on the number of coil turns in a transformer. 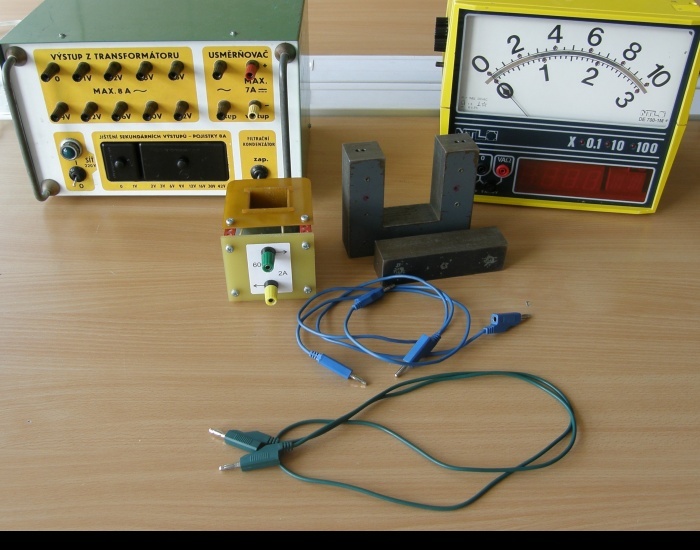 The experiment thus verifies the relationship for the transformation ratio of a transformer in an unconventional way and demonstrates the concept of "voltage per turn" at the same time. A transformer consists of a primary and a secondary winding which are mounted on a common core (see diagram in Figure 1). where U is the voltage at primary (secondary) winding and N is the number of turns on primary (secondary) winding. The constant of proportionality in this case is the ratio of the primary voltage and the primary number of turns. The magnitude of the voltage induced in each turn is referred to as "voltage per turn". Connect the coils to form a transformer on a closed core. Use a coil with 600 or 300 turns as the primary coil, and as the secondary coil, wind one turn around the core. Connect the wire ends to the voltmeter. Connect the primary coil to an 6 V or 12 V AC power supply. On the secondary side of the transformer, add turns and measure the induced voltage. 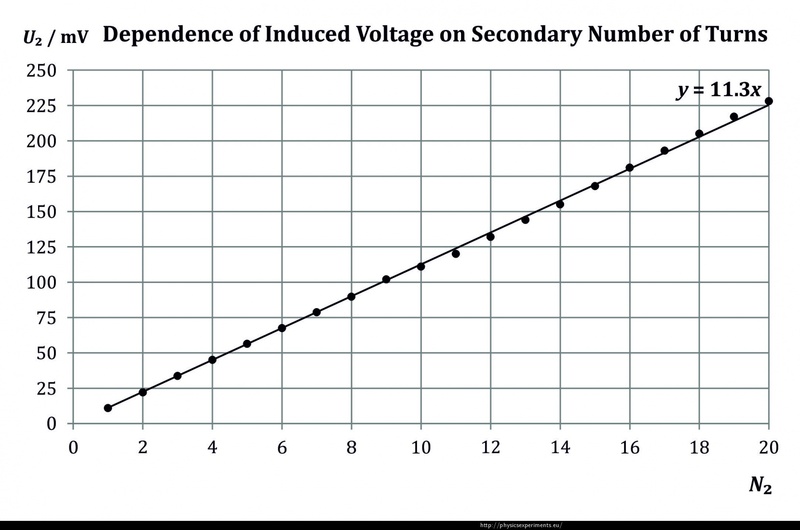 Plot the measured values in a graph of secondary voltage vs. number of turns on the secondary winding. Discuss the measured dependence and compare the observed voltage-per-turn value with the value calculated from the primary winding parameters. An example of measured values is given in the following table. 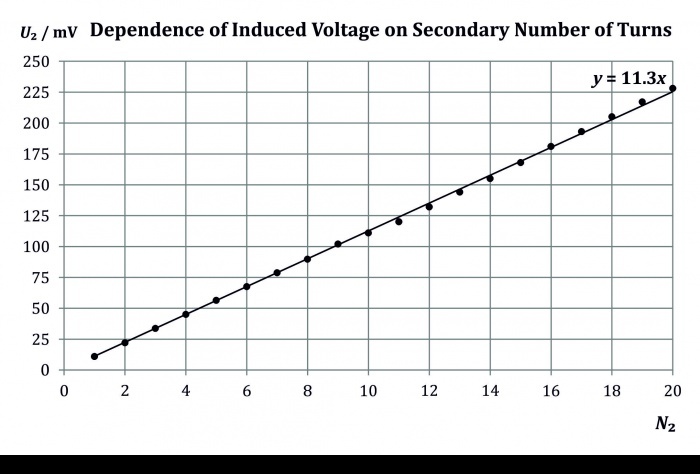 This measurement was made for a primary coil with 600 turns and a primary voltage of 6 V.
Since voltage in the graph is shown in millivolts, the shown slope of the line (and hence the voltage per turn) is 11.3 mV/turn, i.e. 0.0113 V/turn. which agrees with the measured value of voltage per turn. Note: The power supply used, when set to 6 V, gives the voltage of 6.9 V. Then the ratio of primary voltage and number of turns is 0.0115 V/turn, with a secondary ratio of 0.0113 V/turn, which corresponds to the measured value very closely. 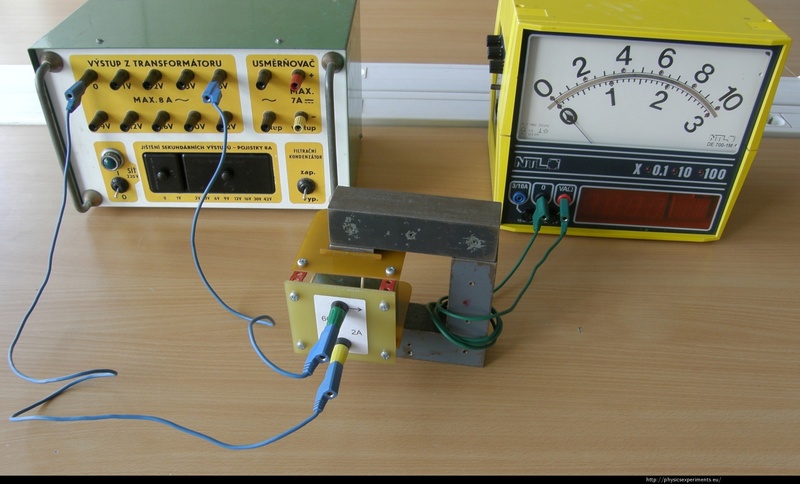 Another unconventional view of the transformation ratio is offered in the task Transformer and the experiment Winding of a Coil.